When it comes to international Search Engine Optimization, no matter what country you want to optimize your site for, the first thing to do is to understand the search market environment. In many cases, Google is simply the main player but there are few countries that this is not the case and Japan is one of them (…..Kind of). Who is the top player in Japanese search market? According to this article, Yahoo! 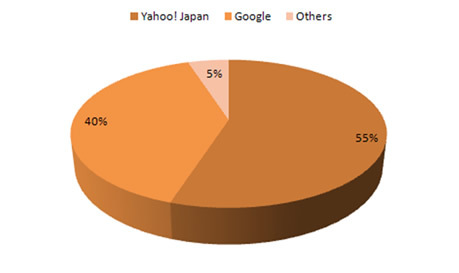 Japan commands 55% of search engine market in Japan while Google claiming 40% of the market. Yahoo! Japan – who powers its search and why? Yahoo! Japan was a joint venture initiated by Yahoo! (USA) and SoftBank in January 1996. Unlike many other countries, where Google is the dominant player, Yahoo! Japan commands about 55% of the search market while Google claims about 40% of the search market in Japan. SoftBank is the majority share holder of Yahoo! Japan to this day which explains why many of its activities do not coincide with Yahoo! USA. The freedom has allowed Yahoo!Japan to choose Google as its search partner to power its search function while Yahoo! USA chose Bing. This is a good news for international SEO professionals because SEO in Japan is essentially optimizing sites for Google. Localization is one of the most important element when it comes to international SEO, thus having a local top level domain will send a signal to the search engines that your site is specifically designed to target that local audience. There are two common Japanese domains .jp and .co.jp but only .jp is readily available to everyone. This is because .co.jp is reserved for Japanese companies and as a part of process to obtain the domain, companies are required to submit “toukibotouhon” issues by the Japanese authority. Social SEO in Japan – Is Mixi still relevant? According to eMarketer, Mixi is now lagging behind Facebook and Twitter in terms of utilization by internet users in Japan. This is welcome news for digital marketers because we now can focus on the social platforms that we are already familiar with. Social media market in Japan is an extremely crowded space where every kind of services you can think of in any categories, they probably already have it (see figure below). Japanese is the primary language in Japan spoken by 99% of the population. Despite the fact that Japanese are well educated in English, they do not use English online. Therefore if you want to reach to Japanese users, creating Geo-targeted social profile is the way to go. Amazon has done a great job in this area (see images below). I have a buyer request inwhich a japeness want help the following web site belong to the person who need help regarding affliate test of amazon.